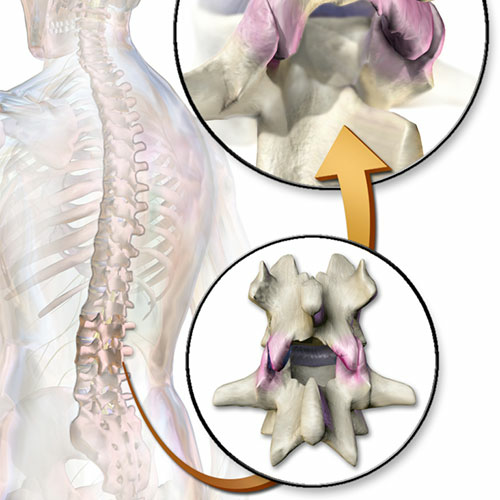 The facet joints are located between each vertebra, and are responsible for the flexibility and stability necessary for movements such as walking, running, bending and sitting. The facet joints are lined with cartilage, which help them move smoothly; when this cartilage wears down, the bones rub against each other, causing facet joint pain — the stiffness, swelling, tenderness and pain associated with facet syndrome. As we age, our joints go through normal wear and tear, causing the cartilage to break down. Because facet syndrome is directly related to joints being affected by cartilage loss, some doctors will refer to it as osteoarthritis. Though it is typically the result of aging, younger people can develop facet syndrome after an injury or overuse. When joints initially become damaged, they will become stiff, painful and swollen. While the inflammation will not last, the pain and stiffness can cause a chronic problem. Some risk factors for developing facet syndrome include being overweight, being in a car accident resulting in whiplash, family history, or the presence of arthritis in other joints. What are the Treatment Options for Facet Syndrome? To properly diagnose your facet syndrome, your doctor will perform a thorough physical exam, along with ordering some imaging tests including MRI, CT or X-ray scans. Your doctor may also choose to perform a facet joint injection to confirm your pain is the result of facet syndrome. These injections will consist of a pain medication and steroids for inflammation. Using a dye and X-ray for guidance, your doctor will inject the mixture into the suspected damaged facet joint to see if your pain is relieved. These injections, paired with physical therapy, can be successful in treating your pain long term. You can also consider medial branch blocks, which use an injection of anesthetics to interrupt the sensory nerves which transmit pain signals to your brain. Should these methods be ineffective, a fusion surgery may be considered in order to help stabilize the damaged joints and to keep them from moving. If you are tired of living with the pain of facet syndrome, contact the Florida Spine Institute today for a personal consultation on how we can best eliminate your discomfort.